On Monday, a team of scientists in Australia announced an exciting breakthrough: For the first time, researchers were able to turn light into sound on a microchip. But—as crazy-sounding new physics applications tend to be—it’s probably going to be a long time before you see one of these chips on a computer you can buy. More importantly, what the heck does “turn light into sound” even mean? To understand the importance of this achievement, you should know there are a ton of researchers dedicating their lives to a (potentially silly-seeming) task: making light particles do what electrons do in computers. If computers ran on light particles, called photons, they could operate with less energy and produce less heat than conventional devices while taking advantage of already-in-use fiber optic cables. But photons are very, very fast. And actually doing something with them requires slowing them down. Fortunately, light and sound are pretty similar, so they translate pretty easily into one another—that’s how radios work, after all. They both move as waves, the former as radiation that can travel through a vacuum, the latter as vibrational waves moving through particles bumping into one another. They both have amplitudes (indicating how strong they are) and wavelengths (indicating the distance between peaks). Scientists call the smallest unit of light photons, while the smallest unit of vibration, or sound, is called a phonon. The researchers’ light-to-sound converting chip, the first such microchip, relies on something called stimulated Brillouin scattering. In this case, two light waves, one containing the data and the other just present to help create the sound wave, are passed through a special kind of wire that guides the light pulse like a special fiber optic cable. When the waves collide, the information in the data-containing light wave’s electric field excites the material, creating a tiny sound wave with corresponding properties. The researchers can reverse this process by sending the sound wave into another helper light wave, recreating the original light wave pulse. The researchers created their light-to-sound storage system on a tiny chip the size of a coin, where the wire doing the conversion was just a micrometer wide but on around ten centimeters in length, coiled up. They claim that the sound waves in their chip travels five orders of magnitude slower than light would, but the signal still lasted only around 3.5 nanoseconds in their chip, and wasn’t perfectly efficient, according to the paper published in Nature Communications. That means the signal only slowed down a little and some of it was lost. According to a back-of-the-envelope calculation, this delay is about ten times slower than the light traveling unimpeded. At least one researcher I spoke to thought the chip was a big deal. “It’s crucial for information transfer,” Lin Tian from the University of California, Merced told Gizmodo. She commented that others have converted light waves into sound before, but doing so on a microchip could put the tech much closer to being used in industrial applications (though still not for a long time—she didn’t know how many years away we’re talking and said it would really depend on interest in the paper). Again, these chips would have pretty technical purposes, but would be needed to build a light-based computer. These computers could potentially be faster, more efficient, and cheaper than the computer you’re reading this article on. 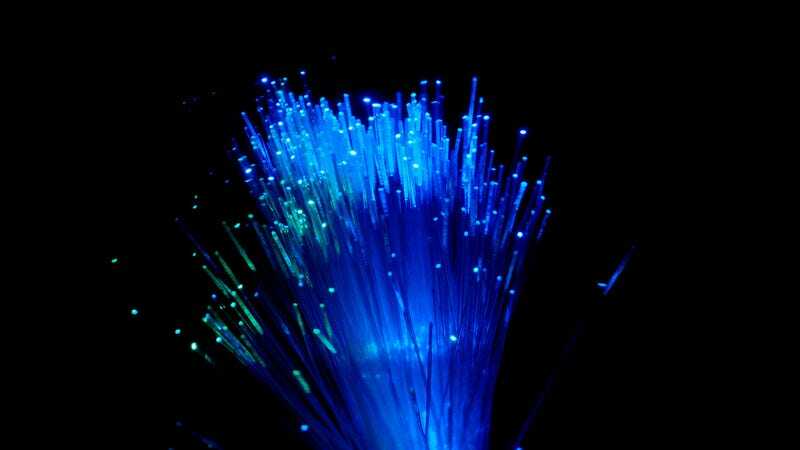 Schliesser explained that, currently, slowing down light would require long coils of fiber optics cables. But this chip and its light-to-sound conversion system could do this with a fraction of the material, thus reducing costs. Tian also explained that the chip might be able to turn the visible light photon into a phonon, and then into a different kind of light particle like a microwave (which could have other useful applications). Ultimately, the research is cool and an important step forward in the field. But, as is usually the case with anything that sounds exciting and is hard to understand, we’re nowhere close to making something you’ll see in your iPhone anytime soon.